This corded necklace is made using satinique cording in white and brown. The length can vary from about 16 to 19 inches with a center jeweled piece that adds over 4 inches. The focal bead is a cross that is cut from a bowling ball and has beautiful swirls of color in orange, brown and white. The back side of the cross has a slightly different look and the piece can be worn either way. The cross hangs separately from an orange ceramic round and 2 orange glass rounds. 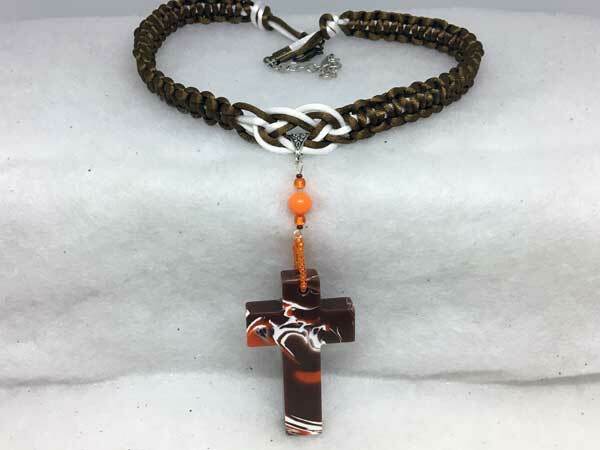 This particular cross is so thick that a tradition bail didn't work, so I have connected it using orange glass seed beads. The piece is finished with a lobster claw clasp and added chain for more versatility with the length.